There is a 50 percent chance Lake Mead, a key source of water for millions of people in the southwestern United States, will be dry by 2021 if the climate changes as expected and future water use is not limited, warn researchers at Scripps Institution of Oceanography at the University of California-San Diego. Without Lake Mead and neighboring Lake Powell, the Colorado River system has no buffer to sustain the population of the Southwest through an unusually dry year, or worse, a sustained drought. In such an event, water deliveries to cities such as Las Vegas, Los Angeles and San Diego would become unstable and variable, say research marine physicist Tim Barnett and climate scientist David Pierce. The researchers say that even if water agencies follow their current drought contingency plans, it might not be enough to counter natural forces, especially if the region enters a period of sustained drought or human-induced climate changes occur as currently predicted. 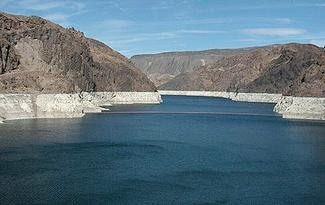 The researchers estimate that there is a 10 percent chance that Lake Mead could be dry by 2014. They further predict that there is a 50 percent chance that reservoir levels will drop too low to allow hydroelectric power generation by 2017. Lake Mead is the largest human-made lake and reservoir in the United States. It is located on the Colorado River about 30 miles southeast of Las Vegas, Nevada, in the states of Nevada and Arizona. Formed by water impounded by Hoover Dam, it extends 110 miles behind the dam, holding approximately 28.5 million acre feet of water. Barnett and Pierce conclude that human demand, natural forces like evaporation, and human-induced climate change are creating a net deficit of nearly one million acre-feet of water per year from the Colorado River system that includes Lake Mead and Lake Powell. This amount of water can supply roughly eight million people. Their analysis of Federal Bureau of Reclamation records of past water demand and calculations of scheduled water allocations and climate conditions indicate that the system could run dry even if mitigation measures now being proposed are implemented. "When expected changes due to global warming are included as well, currently scheduled depletions are simply not sustainable," wrote Barnett and Pierce in their paper, "When will Lake Mead go dry?," which has been accepted for publication in the peer-reviewed journal "Water Resources Research," published by the American Geophysical Union. Barnett said that the researchers chose to go with conservative estimates of the situation in their analysis, though the water shortage is likely to be more dire in reality. The team based its findings on the premise that climate change effects only started in 2007, though most researchers consider human-caused changes in climate to have likely started decades earlier. They also based their river flow on averages over the past 100 years, even though it has dropped in recent decades. Over the past 500 years the average annual flow is even less. "Today, we are at or beyond the sustainable limit of the Colorado system. The alternative to reasoned solutions to this coming water crisis is a major societal and economic disruption in the desert southwest; something that will affect each of us living in the region," the report concludes. The research was supported under a joint program between UC San Diego and the Lawrence Livermore National Laboratory and by the California Energy Commission.